A lack of oversight and enforcement in Oakland is allowing landlords to frequently evade tenant protection laws, leaving renters vulnerable to fraud. More than two years after Oakland enacted tough housing regulations to combat wrongful evictions, roughly three out of four landlords appear to be violating those very laws, according to an analysis by the NBC Bay Area Investigative Unit. Senior Investigative Reporter Bigad Shaban reports on a story that first aired Tuesday, March 26. A lack of oversight and enforcement in Oakland is allowing landlords to frequently evade tenant protection laws, leaving renters vulnerable to fraud. More than two years after Oakland enacted tough housing regulations to combat wrongful evictions, roughly three out of four landlords appear to be violating those very laws, according to an analysis by the NBC Bay Area Investigative Unit. While Oakland’s housing regulations allow for pricey fines, NBC Bay Area has learned not a single landlord has been cited. Skyrocketing rent prices have created a huge financial incentive for landlords to evict longtime, rent-controlled tenants, since finding a new tenant often means a bigger payout for landlords. Property owners, however, are not legally allowed to kick out rent-controlled tenants or dramatically raise rent prices simply because they want to make more money. Despite those restrictions, some landlords have gone to pretty bizarre lengths to dodge those rules. In an attempt to keep the city’s most vulnerable residents in their homes, the Oakland City Council passed a series of sweeping housing reforms over the past several years to protect tenants. Adoption and enforcement of those regulations, however, has often been slow or nonexistent. Many of those reforms focused on "owner move-in evictions," which allow landlords to evict tenants if the landlord, or, in some cases, the landlord’s relative, intend to move into the home and continue living there for at least three years. The evictions, while legal, have been used by some landlords as a fraudulent method to evade rent control laws. For example, landlords have claimed to move into a home after evicting a tenant, but instead rented the apartment to a new tenant at a much higher rent. In early 2017, concerned by a significant spike in "owner move-in evictions" and tenants’ fears that landlords were abusing the system, the City Council amended Oakland’s housing regulations to require property owners sign paperwork, under penalty of perjury, that they actually intend to move into the home after evicting their tenant. The new rules also required landlords to submit evidence, such as a utility bill, on an annual basis to prove they are continuing to live in the home for at least three years following an owner move-in eviction. Eviction records obtained by NBC Bay Area under the California Public Records Act show fewer than 25 percent of landlords complied with the new rules. The records, which took Oakland’s Housing and Community Department nearly a year to provide, reveal only 16 landlords submitted the required documents after filing owner move-in evictions last year, despite a total of 71 owner move-in evictions. Landlords who fail to submit the required documents to the city following an owner move-in eviction can face fines of up to $500. Despite the widespread lack of compliance, however, not a single landlord has been cited, or even contacted by the city, for ignoring the now two-year-old regulations, which went into effect in March 2017. "We want to educate individuals and make sure that they are aware of their rights so that we can prevent any displacement from taking place," said Michele Byrd, director of Oakland’s Housing and Community Development Department. "We don’t want to be the housing cops … if there are individuals where we feel that things are not meeting the regulations, then we will look into it." 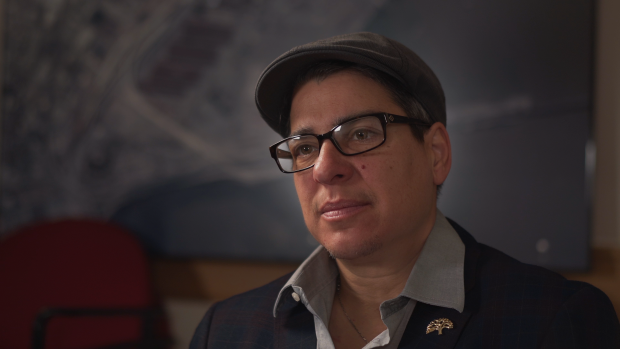 City Council President Rebecca Kaplan, who helped spearhead the push for more transparency and enforcement around owner move-in evictions, called the lax oversight "unacceptable." "It’s not adequately being enforced, and that’s of grave concern to myself and to the hundreds of tenants who continue to suffer," Kaplan said. "I mean, people are being pushed out. If we don’t know whether or not the owner is actually moving in, then we can’t judge whether that eviction was legal or not." There’s too much at stake, Kaplan said, for the city’s tenant protection efforts to be ignored. "We are losing whole segments of our community," Kaplan said. "We’ve disproportionately lost a large share of the African-American community in Oakland, and it’s gotten to the point now that our schools can’t retain teachers, our hospitals can’t retain nurses, because the eviction crisis is so severe." Byrd, however, repeatedly defended the lack of enforcement, stating her department is focused on educating landlords about the requirements, rather than penalizing them for a lack of compliance. "We don’t want to be punitive," Byrd said. "We want to work and ensure that we’re not displacing individuals. And first and foremost is to do education and outreach and make sure that we have made well aware to those individuals involved what the requirements are." Byrd said that education and outreach process has already begun. "We have started working with landlords, yes," Byrd said. "We have systems in place." Byrd’s comments, however, are not accurate. An Oakland spokesperson confirmed Byrd’s department has not contacted a single landlord in violation of these laws, either in an effort to issue fines or "educate" them. Following months of questions from NBC Bay Area, however, Oakland’s Housing Department hired a company on Jan. 31 to help educate landlords and tenants on the various requirements surrounding owner move-in evictions and other housing regulations. The nonprofit group Housing and Economic Rights Advocates will receive $50,000 as part of the yearlong contract. Byrd also said her department has a new manager and other additional staff to help implement and enforce the bevy of new housing laws. "Staffing is critical," Byrd said. "You can’t put systems in place, you can’t operate the database, you can’t oversee a website, you can’t track forms without staff." Byrd said previous staffing shortages were to blame for the slow implementation of aspects of Measure JJ, which Oakland voters approved in November 2016. In addition to expanding "just cause" eviction protections to Oakland tenants, the ballot measure also required city officials to track eviction data and make it publicly available online. Despite the new requirement, it took city officials 11 months to provide the "owner move-in" eviction records requested by NBC Bay Area in April 2018. The lack of oversight, according to tenants and tenant rights advocates, puts Oakland renters at risk of being illegally evicted from their homes. The financial incentives to break housing laws are considerable. If a landlord can rid themselves of a rent-controlled tenant, they can potentially make thousands of dollars more per month in rent by finding a new tenant willing to pay the current market rate for the same unit. Currently, no city agency routinely investigates whether landlords actually move into their homes following an owner move-in eviction. As a result, it remains difficult to quantify the number of wrongful owner move-in evictions in Oakland. However, there is significant evidence of abuse. A 2016 NBC Bay Area investigation into "owner move-in" evictions in San Francisco found hundreds of residents may have been wrongfully kicked out. NBC Bay Area surveyed more than 100 residents at homes where an owner move-in eviction had recently occurred, and in 24 of those cases – nearly 1 in 4 evictions – the landlord or family member was not living in the home, despite records indicating their requirement to do so. NBC Bay Area has been unable to do such a survey in Oakland because, up until recently, the city was unable to provide a database of owner move-in evictions. But anecdotes of potential abuse are plentiful. Last year, NBC Bay Area spoke with Josephine Hardy, the matriarch of three generations occupying each unit of a West Oakland triplex. A new owner recently purchased the home and immediately used an owner move-in eviction to evict Hardy’s son from one of the units. Up until recently, a loophole allowed landlords of owner-occupied duplexes and triplexes to strip tenants of "just cause" eviction protections. As a result, the landlord evicted Hardy’s family from the other two units in the building. Hardy said the landlord failed to move into the unit within the three-month window required by law and remained skeptical he ever intended to do so. The landlord declined to speak with NBC Bay Area on multiple occasions. Last fall, the tenants of a West Oakland triplex ran their own surveillance operation in order to demonstrate they were being wrongfully evicted by a landlord claiming to have moved into their building. He was attempting to evict them using the same practice, which the city has since abolished, allowing landlords in owner-occupied duplexes and triplexes to evict their tenants without cause. Those tenants recorded more than 3,000 hours of surveillance video, which they say showed the landlord rarely ever spent time at their triplex. They argued the landlord was actually living in a single family home he owned in a wealthier part of town. The landlord denied the allegations. Following the NBC Bay Area investigation, however, the landlord never followed through with his eviction attempt. Then there’s the case of Salvador Sotelo, who says his landlord, Rong Fu Lee, tried to illegally triple his rent to $3,000 per month by claiming he suddenly lived in the bottom unit of his West Oakland duplex. Until a recent moratorium on the practice, Oakland landlords who live in their own duplexes or triplexes could legally raise rent prices beyond what’s allowed under rent control. Sotelo, who’s lived in the same unit with his family for the past 16 years, said he didn’t believe his landlord actually lived in the same building. "When someone is living downstairs, it’s easy to hear a little noise," Sotelo said. Sotelo, who said his family would be forced to leave Oakland if the rent increase was allowed, took his case to the tenant rights group Centro Legal de la Raza, which agreed to take on his case. Sotelo was able to collect other evidence, which he believes proves his landlord wasn’t living downstairs, such as video shot by a relative that allegedly shows the landlord’s father unloading trash bags from his van into garbage cans at the same home where his son, the landlord, claimed to be living. Sotelo said it was an effort to make it look like someone was actually living in the downstairs unit. "Obviously, they [were] pretending to live here," Sotelo said. 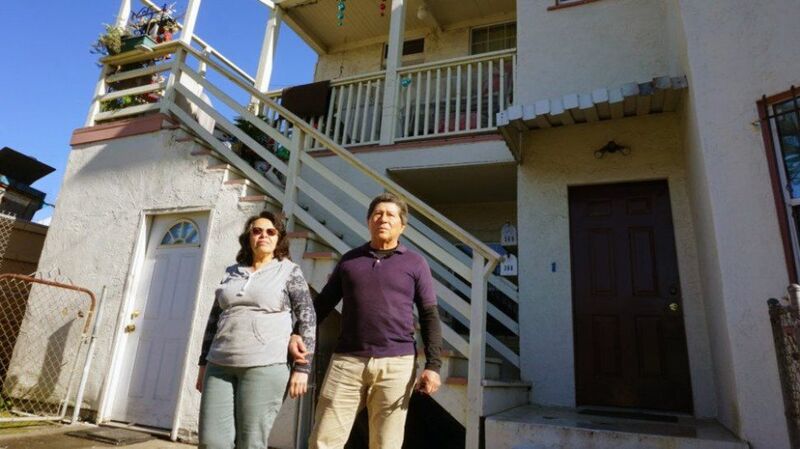 Salvador and Gloria Sotelo accuse their landlord of "faking" where he lives in order to raise their rent. The couple says the landlord's father transports garbage to their building to make it seem as if the landlord is living in the bottom floor unit. Centro Legal de la Raza brought the case to the Oakland City Attorney’s Office, which filed suit against the landlord for "abusive" and "fraudulent behavior." The city even obtained utility bills for the landlord’s apartment, which show Lee went more than two months without using a single drop of water during the time he claimed to be living in the apartment. NBC Bay Area reached out to Lee’s attorneys but never heard back. A trial in the civil case is currently scheduled for October. Sotelo says he is one of the lucky ones. The city stepped in to help him and his family. Yet, he worries the lack of oversight and enforcement means many other families remain at risk of losing their homes. "The city of Oakland needs them," Sotelo said. "I think they deserve to be protected."